Washing cloth diapers is easy, affordable, and fast. To keep things uncomplicated, here are some instructions on the storage of and cleaning of dirty diapers. Some new diapers use fabrics that aren’t fully absorbent until they’ve been washed and dried a few times. Fabrics like hemp and bamboo are the top ones in this category. If you’re using a diaper with any of these fibers, instructions should be included on how many times you should expect to wash and dry before they reach maximum absorbency. These fabrics will usually shrink some as they reach max. absorbency. 1) Try the diaper on your child with a barrier (paper or something) between baby and fabric. If it fits him correctly, proceed. If it doesn’t, return the diaper. 2) Remove inserts from pocket diapers (unless you’re using Pocket Change diapers which agitate the insert out during wash). 3) Turn embroidered diapers inside out to protect and separately rinse out hand dyed diapers a few times since the colors may bleed. 4) Follow washing instructions as below. This is the method that we’ve used from the start with our diapers. It’s the easiest method and works great for us. If you are having any odor issues with this method, you can simply sprinkle baking soda (even with essential oils) in after adding diapers, or use a deodorant disk in your pail. 1) Remove solids from diaper (we use a diaper sprayer; read the review here). If you are exclusively breastfeeding, you don’t need to remove any poo since it’s water soluble. Seriously, just throw the diaper into the pail. 2) Make sure that diaper isn’t dripping wet (wring out if needed) and throw into the pail. Keep a lid on the pail–you don’t want flies getting in or smells leaking out! We use the SafetyFirst Easy Saver Diaper Pail. It’s inexpensive (around $18.00), holds about 20 medium sized pocket diapers with inserts and a few wet bags, contains smells, and is easy to use. I definitely recommend it. We line it with a WAHM made diaper-pail-liner-bag and just throw that right in the wash with the diapers so that it’s clean each time. 3) When you’re ready to wash, just dump the diapers and wet bags into the washer! I haven’t used this method, nor do I suggest it due to the risk of drowning, the extra messiness involved, and the greater potential for odors involved in using stagnant water. 1) Fill a bucket with a locking lid 1/4 the way full of water. Some people also put in some baking soda, vinegar, and/or essential oils to help neutralize odors. 2) Remove solids as outlined above. 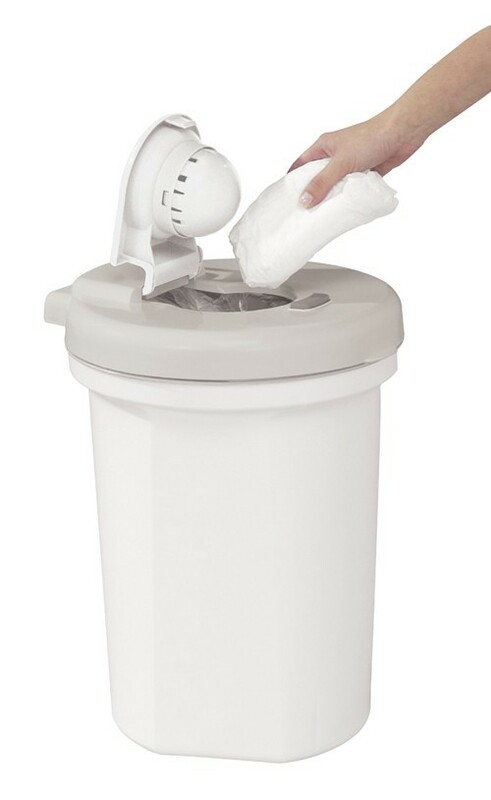 3) Remove liners from diapers, open up, and place in the diaper pail. 4) When ready to wash, either dump the whole pail into the washing machine and set on “spin/drain” to remove the old water, or pre-dump the water into the toilet. Changing the water every day (even if you don’t wash the diapers every day) will help control odors. 5) Wash diapers as directed below. 1) Remove all solids unless baby is exclusively breastfed. 2) Use your washing machine’s highest water setting, and don’t fill completely with diapers (we wash about 20 at a time, every three days). If you pack the machine with diapers, the fabrics will rub against each other quite a bit and increase pilling at an earlier age. 3) Pre-rinse your diapers in cold water to prevent stains from setting and to remove any particles still stuck to the fabrics. 4) Wash diapers on a full hot-cold cycle, using 1/4-1/2 the recommended allotment of soap (be sure to read the “what detergents to use” section below). 5) Run through an extra cold rinse if you’re worried about soap residue. If you’re not worried, don’t bother with an extra rinse. 6) Put in dryer on medium or high heat until dry (depends on the diapers and fabric. Pocket diapers dry quickly while AOI diapers take a while. Microfleece dries pretty fast, while hemp takes a while), or line dry (great method–saves money and bleaches stains and microbials out of fabric using UV rays). You can not use regular detergents when washing cloth diapers. They leave residue on your clothing, which will build up on the diapers, causing them to leak. “Free & Clear” detergents don’t cut it, either. They may not contain any scents, but they do contain special “brighteners” or “whiteners” which cling to your fabric. Do not use fabric softeners–liquid or sheets! These build up residue on your clothing and will cause your diapers to leak. Do not use regular diaper rash creams on a baby wearing a cloth diaper. They get stuck on the diaper. Instead, I recommend California Baby or Burt’s Bees Baby Bee Diaper Ointment (this is what we use–never have had a problem with our pocket diapers). If you must use a regular cream just put a disposable liner into the diaper so that the cream doesn’t touch the fabric. Don’t expect a cloth-diapered baby to have a rash, though! They rarely do, so make sure you investigate the cause if one pops up. Minimize the use of bleach. We avoid it altogether. While some manufacturers recommend using it (bumGenius suggests using it 1x/month), it will break down your diapers. Not to mention it stinks and is toxic. There are a variety of detergents that are safe to use when cleaning cloth diapers. Generally, you’ll end up trying one for a while and if it doesn’t work, switching to something else. The best guide to detergents that I’ve found is at Jillian’s Drawers. 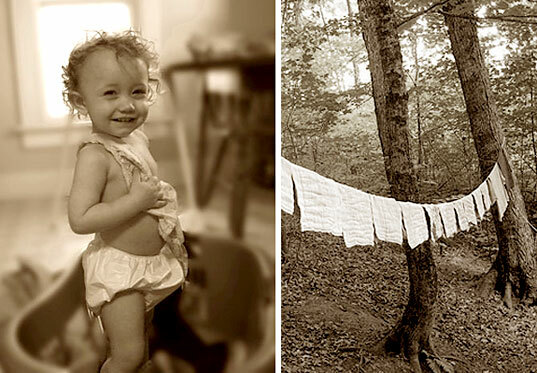 Charlie’s Soap and Allen’s Naturally are the most popular detergents to use for cloth diapers. 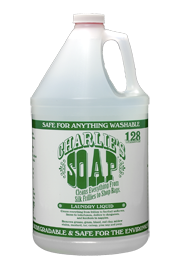 We use Charlie’s Liquid Soap in the amount that they recommend. It works great, leaves no residue, and actually increases the fire retardant-ness of fabrics! Whatever soap that you choose to go with, keep in mind that you’ll probably only need to use 1/4-1/2 of the amount the company says to use (even less if you have a HE machine). If your diapers seem to keep odors (even pleasant ones), then you’re using too much. Cut back and do an extra rinse. If they continue to be smelly, you need to strip your diapers.